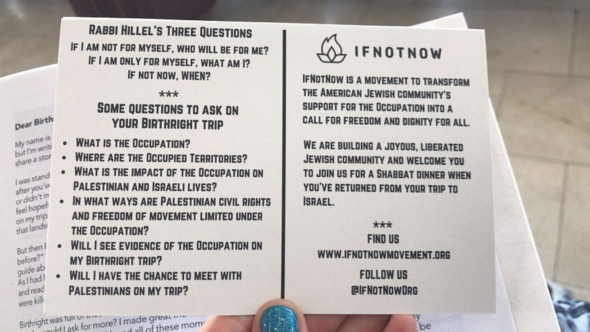 Participants in IfNotNow’s training may be targeting Ramah camps, Young Judea camps, the Union of Reform Judaism camps, and Hashomer Hatzair, Habonim Dror, and Bnei Akiva camps. IfNotNow does not talk about peace, or about ending the violence directed towards Israel by Palestinians and their Arab allies. IfNotNow does not talk about peace, or about ending the violence directed towards Israel by Palestinians and their Arab allies. Israel has in the past pursued repeated efforts to end its presence in the West Bank (Judea and Samaria), including in 2000 and 2001 at Camp David and Taba under Prime Minister Ehud Barak, as well as in 2008 under Prime Minister Ehud Olmert. Former Palestinian Authority President Arafat responded with a terror war and Palestinian Authority President Abbas responded with rejection. This article also stated that one suggestion made during the training was to “practice with them [i.e., 12 to 15 year old campers] saying the Kaddish every morning for Palestinians who have been killed in Gaza or its environs.” As noted above, this is essentially saying Kaddish for terrorists who died while trying to kill or harm Israelis. While some Palestinians who have died in the fighting are innocent, there does not appear to be any attempt made to distinguish the innocent from the terrorists. Ramah Camps have made clear that they won’t incorporate IfNotNow’s program into their curriculum. It’s unclear, however, whether an individual counselor will be able to undermine Ramah’s approved curriculum. IfNotNow has reportedly indicated that its intention is to do so. Contributed by CAMERA’s Karen Bekker.